[SatNews] “Right from the start, we recognized that each of our customers would have specific needs and we set out to develop solutions that would be right for each and every one of them. Jampro Antennas, Inc. manufacturer and designer of antennas, combiners and filters and RF components for every application in radio and television broadcast including DTV, DVB-T, FM and HD Radio solutions, is unveiling a variety of new antenna solutions for the international broadcast market at IBC2013 in Stand 8.B96. The company has provided more than 25,000 broadcasters worldwide with products, is also discussing its continued dedication to its global customer base by serving the needs of individual broadcasters with fully customizable, high-quality and competitively priced systems. At IBC2013 Jampro is exhibiting broadband solutions that bring great value and outstanding features to all segments of the broadcasting industry. UHF Broadband Medium Power Panel Antenna for All Polarizations: Jampro‘s UHF Broadband Medium Power panel antenna is now available for Bands IV & V in all polarizations: CPOL, EPOL, HPOL and VPOL. The antenna is designed as either a side-mount or a top-mount for DTV, ISDB-T, DVB-T/H, NTSC or PAL broadcasting. JVD-U and JCD-U Broadband UHF Broadband Antennas Now available for both VPOL and CPOL polarization the JVD-U and JCD-U broadband antennas for UHF Bands IV & V, these antennas were designed as low to medium power solutions, with a special focus on rooftop deployment. The antenna is a vertically or circularly polarized system enclosed by a full cylindrical radome for environmental protection and minimal urban visual impact. The antenna is broadband over band IV/V allowing multiple UHF channels to be transmitted at the same time. Ruggedly constructed from marine brass and aluminum and designed for long life and value, this antenna is ideal for DVB-T2 (ISDB-T or ATSC digital TV application) channels. The antenna is fully assembled and tested before shipping to the customer. 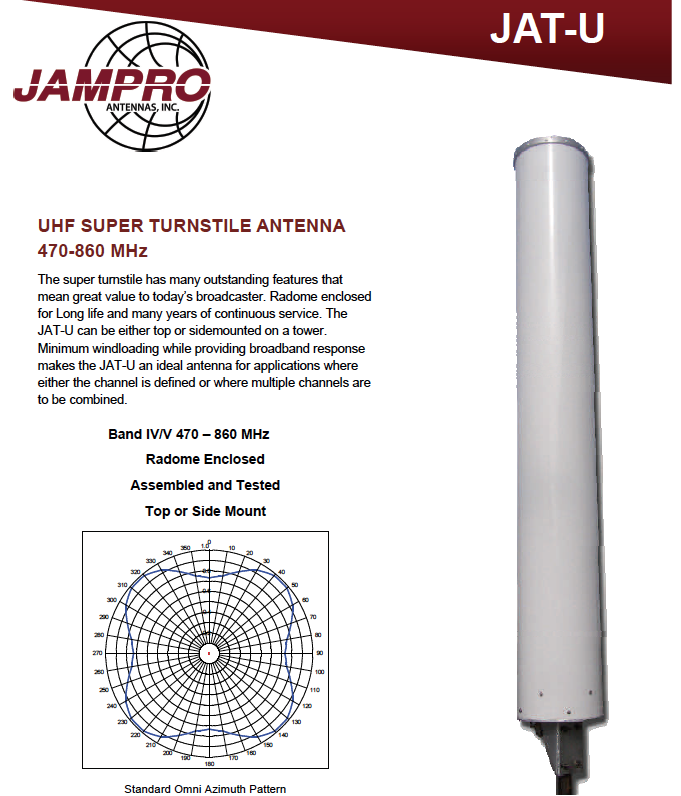 JAT-U UHF Super Turnstile Antenna Jampro’s Broadband Batwing IV/V 470 – 860 MHz Antenna has many outstanding features that bring great value to today’s broadcaster. The radome-enclosed unit can be either top or side mounted on a tower offering long life and many years of continuous service, ideal for broadband multi channel UHF applications. Minimum windloading while providing broadband response makes the JAT the perfect answer for applications where either one channel is defined, or multiple channels are combined. 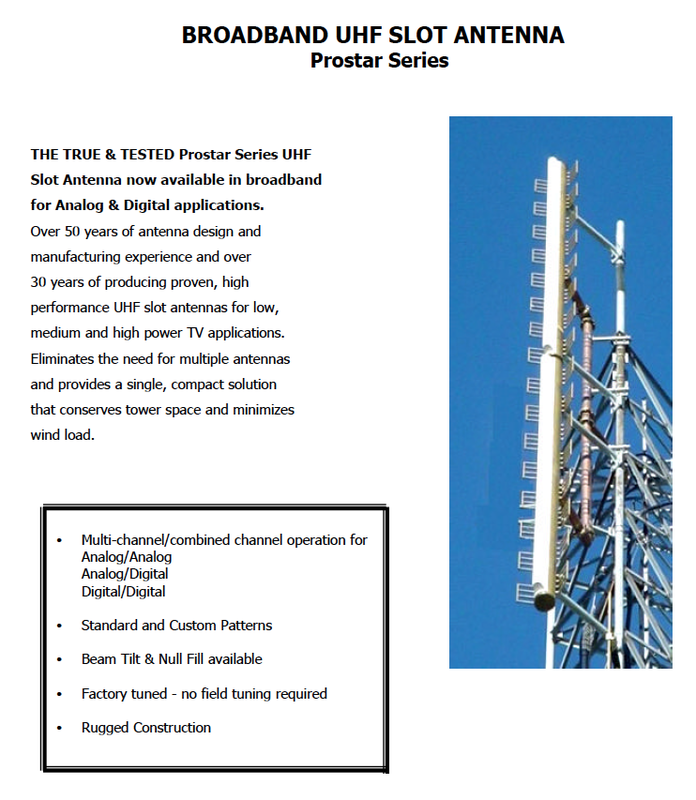 Prostar JA/MS-BB Broadband UHF Slot Antenna Jampro’s JA/MS-BB Broadband UHF Slot antenna, part of the legendary Prostar™ line, offers an economical alternative to buying, installing and maintaining multiple antennas. A single, compact solution, it conserves tower space and minimizes wind loading. Especially designed for multi-channel or combined-channel operations in analog-analog, analog-digital or digital-digital TV applications, the JA/MS-BB antenna comes factory tuned in an elegant, ready-to-install and streamlined design. 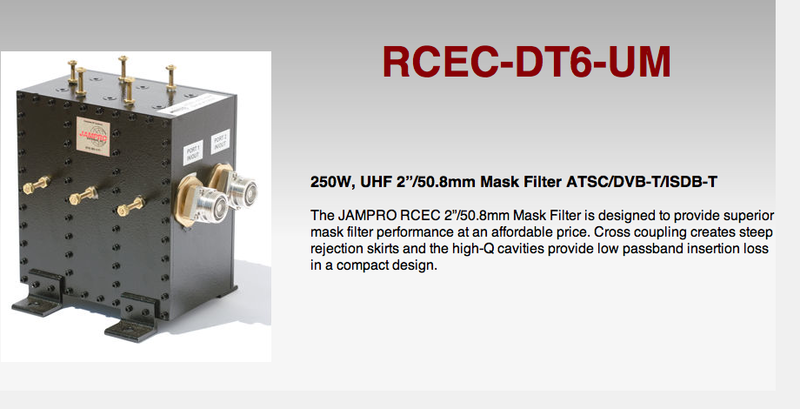 Jampro Family of RCEC Mask Filters Jampro offers a family of RCEC mask filters designed to provide superior mask filter performance at an affordable price. Cross coupling creates steep rejection skirts and the high-Q cavities provide low pass band insertion loss in a compact package.